Israeli soldiers shelled Gaza killing up to 1,000 people and leaving thousands others wounded. The Emergency Summit on Gaza Strip, which concluded on Jan. 16, condemned Israel with strong terms over its aggression on Gaza Strip. It called for immediate cessation of the Israeli aggression on the Palestinian people in Gaza. The summit called for immediate withdrawal from Gaza strip. In its final communiqu the summit held Israel accountable for the crimes and genocide committed in Gaza. It called for suing Israel for those crimes. The summit also called for lifting the siege on Gaza and opening of the crossing points, as well as lifting of the restrictions on people, goods and properties. It called on the international community to provide urgent aid to the Palestinian people in Gaza and protect the international organisations to discharge their humanitarian duties in Gaza without restrictions. The summit called for setting up a reconstruction fund for Gaza. It called for reconciliation among the Palestinian factions. The summit urged the Arab countries to suspend the Arab Peace Initiative. It hailed the attitudes of Qatar and Mauritania for freezing their political and economic relations with Israel. The summit welcomed the call of Senegalese President Abdoulaye Wade to hold an emergency meeting of the Organisation of Islamic Conference (OIC). Ahmed bin Abdullah Al Mohamoud, Qatari State Minister for Foreign Affairs read the final communiqu . These resolutions will be submitted to the Kuwaiti Economic Summit, which will address the Gaza issue. 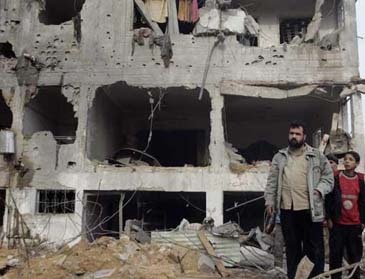 In the meantime, UNICEF warned that due to the fighting on the ground, it is impossible to access UNICEF warehouse or conduct rapid needs assessment in Gaza Strip. It added that the three-hour daily cease-fire is also too short and the needs of the population are so great, that humanitarian assistance programmes need to operate round the clock. UNICEF responded to the needs of the injured children and women through providing 355 first aid kits (3,500 people), 20 resuscitation kits (200-300 persons), 13 emergency health kits sufficient for 10,000 people for a period of 3 months; two 12KVA generators given to UNRWA to support the blood bank preservation. To address the needs of at least 120 newborns per day to safe and clean delivery and 560 high risk pregnancy women per month, UNICEF provided 8 obstetric and midwifery kits sufficient for 400 deliveries. Given the interruption in the immunization services since 27 December, UNICEF ensured vaccine security through maintenance of cold chain system through the provision of 10,000 L3 fuel tanks. UNICEF is coordinating with MoH and the Food Security/ Nutrition cluster, to harmonize and map out partners' capacity to deliver, to harmonize technical guidelines on nutritional supplements and ready to use therapeutic foods to maximize impact for children and women. UNICEF key partners include Ministry of Health, local NGOs (Union of Health Work Committees, Palestinian Red Crescent Society); UN agencies (WHO, UNFPA, UNRWA). Partners in the nutrition programme include Ard El Ansan (local NGO), UN agencies (WHO; WFP; UNRWA; and FAO). The schools were scheduled to start on 17 January, however the recent military operation and shelling in Gaza has resulted in significant damage to schools' infrastructure and loss of equipment and stationary. UNICEF and partners are discussing interventions to assure that over 40,000 children in the first batch can start school by early February. It is impossible to currently assess the situation due to continuous fighting in Gaza. As an initial and rapid response, 100,000 copies of a leaflet on Explosive Remnants of War(ERW) and UXO were printed and distributed in Gaza through UNICEF child protection partners: World Vision: 3000 copies; UNFPA: 2000 copies; CHF: 5000 copies; Handicap: 1000 copies. The rest of the leaflets are now in UNICEF Ashdod warehouse and will be delivered to Gaza. In addition, two radio spots for parents on how to protect children during bombardment and shelling as well as how to provide children with emotional support are being aired daily - 10 times /day on 4 radio stations in Gaza. UNICEF provides support to a national NGO, Palestinian Centre for Democracy and Conflict resolution (PCDCR), which runs a toll phone line providing one-on-one support to parents and children daily between 9:00AM-midnight. CP beneficiaries: Around 1 million. UNICEF has responded by providing 66,250 bottles of 1.5 litres to Palestinian Red Crescent Society (PRCS) for distribution to benefit 66,000 conflict affected person; as well as 500 family water kits for 5000 families of 6 people delivered to PRCS for distribution. PRCS distributed 50 water family kits for 6,000 persons. These kits were pre-positioned with the PRCS previously.